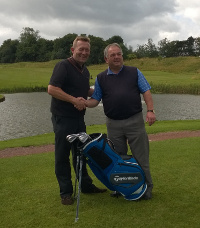 It couldn’t have been a better result for the 10th Halcyon Drives Golf Day on 4th July 2014 when Simon Goff, from CambridgeHOK Construction Ltd, managed to get a hole in one on the 15th hole at Cookridge Hall Golf Club. Simon’s prize was a set of TaylorMade RocketBladez HP Irons & a White Smoke Putter, one of the fantastic ancillary prizes that was on offer to all 40 golfers on the day. Despite the rain during the day, the morale was certainly warm & shining bright as a result of the hole in one. We are especially pleased for Gary Day, General Manager at Cookridge & Steve Cordwell, Event Organiser, who are good clients of Worldwide Hole ‘N One. They are true believers in the value that a hole in one prize package can bring to a golf day; it was great to get a call that Simon had won a prize. Halcyon Drives Ltd, a northern-based UK leader in engineered control solutions for British Industry, who’s 40 players consisted of major customers and suppliers also raised £800 for the Crohns & Colitis Charity. A successful day all round! Pictured above, from left to right – Simon Goff from CambridgeHOK Construction Ltd & Martin Rhodes from Halcyon Drives Ltd.